My pregnant friend asked for a print of the The Womb (the original), but I didn’t have any. I didn’t want to disappoint her so I decided to paint The Womb 2. At the time I started painting she wasn’t sure if she was having a boy or girl, so I kept the colors gender neutral (and I love green). 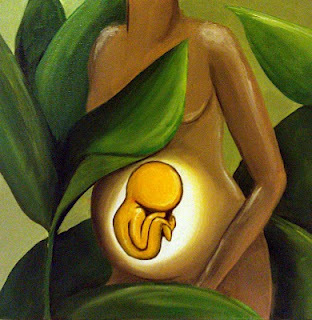 I like the composition of The Womb 2, but I like the raised baby effect from The Womb. Can't believe I've never seen this one…love it!